Washington – Today, the Visit U.S. Coalition called on Congress to renew Brand USA – a vital economic driver that encourages international travel to the U.S. at no cost to the taxpayer. Brand USA is a public-private partnership established to market the United States as a travel destination to international visitors. Congress created the program in 2010 with strong bipartisan support. Today, Brand USA operates at a 29:1 return on investment — a program with undeniable economic benefits at no cost to the taxpayer. The program is funded by a small fee from international travelers who qualify for the Visa Waiver Program that is matched 1:1 with private dollars. However, the administration’s fiscal year 2020 budget recommends diverting funds from Brand USA. Earlier this year, nearly 600 businesses and organizations wrote a letter to Congress in support of Brand USA renewal – referencing the $2.4 trillion in economic output and over 15 million American jobs created by the travel industry. More travel to America would lower our trade and budget deficits. The trade deficit expanded in 2018 to its highest level in at least a decade, even though candidate Donald Trump promised to dramatically narrow the gap. A big reason for that $878 billion deficit is the health of the U.S. economy. Consumers are flush with cash, and they’re spending it. The trade deficit always goes up when the economy is strong and plummets when the economy sinks, as it did during both the Great Depression of the 1930s and the Great Recession of 2008–09. Still, the near-trillion-dollar trade deficit is a black eye for Trump, and there are some important steps he could take to bring it down. One is to get the trade deal done with China to level the playing field and expand American markets to the billion-plus Chinese. While Trump policies have given a big boost to manufacturers and the construction industry, perhaps it’s time to tout another critical but underappreciated export industry: travel and tourism. Nearly 600 organizations representing all 50 states delivered a letter to Congress on Thursday, urging a renewal of Brand USA and its funding this year. Brand USA’s funding was inadvertently diverted in the Balanced Budget Act of 2018. The Visit U.S. Coalition, an organization created last January to address the decline in inbound travel growth, organized and delivered the letter to Capitol Hill. In it, the signatories say that Brand USA, the public-private partnership established to market the U.S. as an international travel destination, is critical to their businesses. They include multinational corporations, tourism bureaus from coast to coast as well as restaurants and attractions. The Visit the U.S. Coalition warned that if Congress fails to renew Brand USA and its budget, $17.7 billion in visitor spending, $5 billion in tax revenue, and 51,000 American jobs are at risk. The Visit U.S. Coalition distributed a letter to Capitol Hill endorsed by nearly 600 organizations representing all 50 states urging Congress to renew Brand USA this year. Brand USA is a public-private partnership established to market the United States as a travel destination to international visitors. Congress created the program in 2010 with strong bipartisan support, funding it with a small fee paid by incoming foreign travelers rather than out of general revenues and contributions from the private-sector. Now, Brand USA operates at a 29:1 return on investment—a program at no cost to the taxpayer. The letter, which was organized by the Visit U.S. Coalition, is signed by a diverse array of companies and organizations across multiple industries that depend upon international inbound travel. WASHINGTON – Today, the Visit U.S. Coalition applauded Heritage Foundation economist Stephen Moore’s white paper on international travel’s ability to reduce the U.S. trade deficit. The study found that “promoting and facilitating foreign tourism to the United States can be an effective way to increase American jobs and national output while reducing the nation’s trade deficit.” Moore’s white paper can be viewed here. Commit to a national goal of welcoming 100 million tourists by 2020 and 150 million by 2030. “Dr. Moore’s analysis shows the direct impact of travel to the U.S. economy. By promoting America as a top tourist destination, we are investing in a powerhouse industry—projected to grow 1.3% faster per year than the entire economy. President Trump has already stated that ‘America is open for business,’ and we are excited to see a top economist championing travel as a key factor in our economic growth,” said Visit U.S. Coalition spokesman Amos Snead. When international travelers visit the United States, their spending at hotels, restaurants, and retail stores totals nearly $250 billion per year. This economic activity supports approximately 1.2 million U.S. jobs and at least $30 billion in worker pay and benefits. 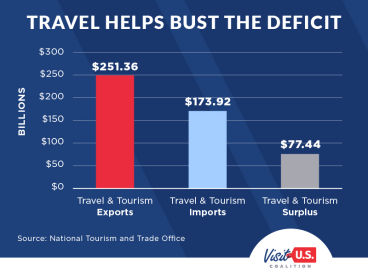 In 2017, international tourism generated a $77 billion trade surplus—consequently reducing the U.S. trade deficit, valued at $552 billion, by 14 percent. The Visit U.S. Coalition has formed around the belief that Americans want both security and a robust economy – and can have both. Working alongside the White House and Congress in support of good-paying American jobs, Visit U.S. is committed to making America both the most secure and most-visited country in the world. For more statistics on the economic impacts of travel, click here. Washington – Today, the Visit U.S. Coalition distributed a letter to Capitol Hill endorsed by nearly 600 organizations representing all 50 states urging Congress to renew Brand USA this year. Brand USA is a public-private partnership established to market the United States as a travel destination to international visitors. Congress created the program in 2010 with strong bipartisan support, funding it with a small fee paid by incoming foreign travelers rather than out of general revenues and contributions from the private-sector. Today, Brand USA operates at a 29:1 return on investment—a program with undeniable economic benefits at no cost to the taxpayer. Brand USA funding was inadvertently diverted in the Balanced Budget Act of 2018. As international travelers who qualify for the Visa Waiver Program travel to the United States, they pay a small fee. To date, a portion of that fee has been used to fund Brand USA, and those fees have been matched 1:1 by private funding. If Congress does not renew Brand USA this year, $17.7 billion in visitor spending, $5 billion in tax revenue, and 51,000 American jobs generated are at risk. The Visit U.S. Coalition represents a broad cross-section of industries that have come together to address the decline in the U.S.’s international travel market share and resulting opportunity cost to the U.S. economy and jobs. I was recently visited by officials from the Visit U.S. Coalition — which is made up of owners of hotels, restaurants, airlines, amusement parks, shopping centers and so on — and they alerted me to a lost opportunity here. The number of international tourists to these shores has fallen by about seven-and-a-half-million people since 2016. This trend didn’t start under Mr. Trump. Prior to Sept. 11, 2001, the United States was the destination for about one-in-six international trips, but now we are the destination for about one-in-eight. More people travel to Spain in a year than the United States. Is that a tear rolling down Honest Abe’s cheek in his memorial. Washington – Today, the Visit U.S. Coalition applauded the introduction of the JOLT Act. This legislation will update and streamline programs to promote international travel to the U.S. – creating jobs and boosting the economy. The JOLT Act was introduced by Reps. Tom Rice (R-S.C.) and Mike Quigley (D-Ill.). Hotel CEOs and Business Leaders on the Impact of International Travel to the U.S.
Watch U.S. Travel Association President and CEO Roger Dow, Asian American Hotel Owners Association President and CEO Chip Rogers, President and CEO of Wyndham Hotel Group Geoff Ballotti, and President and CEO of Best Western International David Kong, talk about the power of international travel to the U.S. IN THE NEWS: BLOOMBERG RADIO – The Visit U.S. Coalition’s newly announced policy agenda. Bloomberg Radio’s Rich Johnson discusses the Visit U.S. Coalition’s newly announced policy agenda. “Today’s release brings into sharp focus the urgent need to reverse the decline in international inbound travel to the United States,” said Visit U.S. spokesman Amos Snead. “The number of international travelers to the U.S. has been declining since 2015—and every year of decline represents billions of dollars lost, and that ripple effect is felt throughout the American economy. The Visit U.S. Coalition was formed to work with the Administration to increase international inbound travel, and thus increase economic growth. Through smart policies and a welcoming message, we can ensure that the United States is the most secure and most visited country in the world. The Commerce Department reported today that following a 2.8 percent decline in 2016, spending by international visitors in the U.S. fell 3.1 percent in 2017 to a level or $149 billion — the lowest level since 2013. The declines in 2016 and 2017 in international visitor spending in the U.S. marked the first time since the 2002-2003 that this spending declined over two consecutive years. From 2015 to 2017, spending by international visitors declined by 5.8 percent, while other U.S. exports increased by 3.5 percent. The overall trade surplus in travel was $70 billion in 2017 – down from $84 billion in 2016 – making it the smallest trade surplus since 2010. Last week, a number of trade organizations launched the Visit U.S. Coalition, aiming to reverse the decline in inbound visitors to the U.S., where global-travel share fell from 13.6% to 11.9% from 2015 to 2017, even as overall global travel increased 7.9%. Roger Dow, CEO of the U.S. Travel Association (a founding group), explained to news editor Johanna Jainchill why the Trump administration needs to make inbound travel a priority. U.S. Travel Association Chief Executive Roger Dow has called the government data “deeply concerning … to anyone who cares about the economic well-being of the United States” and said “correcting this troubling trend needs to become a national priority.” A new industry coalition, Visit U.S., is planning to highlight the contributions of foreign tourists, who according to the trade group generated $246 billion in spending in 2016 and directly support 1.2 million jobs.